Research in the group of Biomechanics and Mechanobiology focuses mainly on (i) the interactions between tissue multiphysics and biological processes, and (ii) how these interactions can affect the functional biomechanics of organs. Numerical methods based mostly but not exclusively on FE modelling are used to describe both the tissues at the organ level, and the tissue-cell interactions at the tissue and cellular levels. The numerical concepts developed are tested against in vivo and in vitro data, which allows model validations. Emphasis is given in the study of load transfer of organ conditions onto the cells or onto tissues, with or without treatment simulations. Calculations are based on mechano-regulation and/or on biophysical concepts to predict different cell environments over time. Most tissue and biophysical models developed so far aimed to study one of the most complex organs of the musculoskeletal system, namely the spine. Thorough knowledge about the functional biomechanics of the lumbar spine has been acquired along the time in relation to computational simulations (J Biomech, 40, 2414-25; Biomech Model Mechanobiol, 10, 203-19). In order to capture as best as possible the communications between organ and tissue biomechanics, studies of advanced tissue models have been performed, in relation to the vertebrae (Mater Lett, 78, 154-58), to the intervertebral discs (J Mech Behav Biomed Mater, 4, 124-41; Comput Meth Biomech Biomed Engin, 16, 923-8) and to the muscles (J Biomech, 45, S484). Left: Principal stress predictions in a model of the human hip joint. Right: bone stress analysis at the femorotibial junction. In particular, these models allowed thorough identification of the tissue parameters expected to alter cell nutrition in a deforming intervertebral disc (PLoS Comput Biol, 7, e1002112), leading to further relations between tissue condition and cell viability (Poromechanics V, 2193-2201). Care is also taken to assess the physical meaning of the tissue model parameters, and the mechanistic aspect of the simulation work is supported by both stochastic modelling and bioreactor experiments. The numerical stability of these models is also one target of the explorations performed within the group (J Mech Behav Biomed Mater, 26, 1-10), in order to ensure the coupling to lower scale biophysical models. Also, models have been used to for implant simulations focussed either on clinical (J Appl Biomat Biomech, 4, 135-42), or on design questions (Eur Spine J, 21, S675-87). Beyond the spine domain, both knowledge and know-how acquired are being transferred to the exploration of the cardiovascular system. Also, on-going clinical collaborations are contributing to the adaptation of the numerical methods to study problems and treatment solutions related to the lower limbs (J Biomech, 45, S163). The newsletter of the VPH-Share EU project contains an article in which Jérôme is interviewed about the MySpine project. Some of the group’s latest published work has been featured by the software company SIMPLEWARE. Andrea Malandrino, a postdoc in IBEC’s Biomechanics and Mechanobiology group, will spend two years at the Massachusetts Institute of Technology (MIT) with a Marie Curie International Outgoing Fellowship. Research on muscle modelling at IBEC’s BMMB group rewarded twice! Themis Toumanidou, PhD candidate in the BMMB group, has been recently rewarded with the best scientific contribution to the Third Annual Meeting of the Spanish Chapter of the ESB. Themis is working on the development of a muscle constitutive model that is able to act as a strain-activated motor, helping the deformation imposed to the fascicles, as it is necessary to generate voluntary motions. The model has been coupled to a finite element model of the lumbar spine, and has shown its ability to interact with the fluid pressurization simulated in the intervertebral disc, leading to the calculation of intradiscal pressure values close to those measured in vivo. She had already won the prize for the best flash presentation at the 2013 IBEC Symposium. Yesterday the III Spanish Chapter Meeting of the European Society of Biomechanics (ESB) was celebrated and organized by the Institute for Bioengineering of Catalonia (IBEC). The event took place at the Parc Científic de Barcelona (PCB) and hosted 60 people from research centres, hospitals and universities throughout Spain. The group has produced a poster to explain their technology transfer activities. The BMMB group will be co-organising and hosting the third meeting of the Spanish National Chapter of the European Society of Biomechanics (ESB) at IBEC on 23rd-24th October 2013. The meeting itself will take place on the 24th, while the 23th will be dedicated to the organization of three additional courses related to biomechanical modeling for patients. The Spanish National Chapter was created in 2011, and the first and second Chapter meetings were held in Zaragoza and Seville. In addition to the scientific quality of the papers presented, these two events marked important guidelines: the first meeting elected the first Executive Committee, of which Jérôme Noailly is a member, and the second set up awards to recognize the scientific quality of the work of the chapter members. In line with previous meetings, the goals of the 2013 meeting are: • To present the work of different Spanish groups in the field of biomechanics; • To promote the National Chapter and the ESB to other Spanish groups working in biomechanics; • To support the creation of partnerships between different groups in Spain; • To serve as mediator for doctors and clinical professionals who are interested in biomechanics; • To present the progress and new initiatives from the Executive Committee and collect the opinions of the Chapter members to establish a roadmap for the coming year. The deadline for submission of abstracts is September 19th. More information is available at http://capituloesb.ibecbarcelona.eu. The IBEC-coordinated European project MySpine, which reached its midpoint at the end of August, received a positive appraisal at its first Annual Review in Brussels in June. The European Research Media Center’s website, youris.com, features an article about the MySpine project, which is coordinated by IBEC group leader Damien Lacroix. The misery of lower back pain is, unfortunately, all too familiar to many people. Now researchers have taken a big step towards understanding one of the most common and debilitating complaints in the industrialized world, with results that could help to predict the onset of disc degeneration. The Biomechanics and Mechanobiology group’s work and Damien Lacroix’s recent ERC grant is the subject of an article in this month’s Teraflop, the magazine of the Centre de Serveis Científics i Acadèmics de Catalunya (CESCA). Biomechanics and mechanobiology group leader Damien Lacroix has been awarded a prestigious European Research Council (ERC) Starting Grant for his research on finite element simulations of mechanobiology in tissue engineering. The kick-off meeting of one of IBEC’s EU projects, MySpine, is taking place at the institute this week. The consortium partners from the Netherlands, Austria, France, Spain and Hungary have gathered to outline the work packages for ‘Functional prognosis simulation of patient-specific spinal treatment’ and discuss the plans for the next six months. An interview with Biomechanics and mechanobiology group leader Damien Lacroix about the new EU-project he coordinates, MySpine, has been broadcast on Ràdio 4’s L’Observatori programme. Dr. Damien Lacroix, head of the research line Biomechanics and Mechanobiology of IBEC, has been elected president of the European Society of Biomechanics (ESB). Damien Lacroix has belonged to the ESB since 1999, and been part of the council since 2004. He is author of 27 articles in specialized journals and has participated in more than 80 conferences. Damien Lacroix, group leader in research on Biomechanics and Mecanobiology at IBEC (Institute for Bioengineering of Catalonia) has been awarded a prize by the European Society for Biomaterials (ESB) for his innovative contributions in the field of biomaterials. Motivation: Biological mechanisms contributing to atherogenesis are multiple and complex. The early stage of atherosclerosis (AS) is characterized by the accumulation of low-density lipoprotein (LDL) droplets, leading to the creation of foam cells (FC). To address the difficulty to explore the dynamics of interactions that controls this process, this study aimed to develop a model of agents and infer on the most influential cell- and molecule-related parameters.Results: FC started to accumulate after six to eight months of simulated hypercholesterolemia. A sensitivity analysis revealed the strong influence of LDL oxidation rate on the risk of FC creation, which was exploited to model the antioxidant effect of statins. Combined with an empirical simulation of the drug ability to decrease the level of LDL, the virtual statins treatment led to reductions of oxidized LDL levels similar to reductions measured in vivo.Availability and Implementation: An Open source software was used to develop the agent-based model of early AS. Two different concentrations of LDL agents were imposed in the intima layer to simulate healthy and hypercholesterolemia groups of â€˜virtual patientsâ€™. The interactions programmed between molecules and cells were based on experiments and models reported in the literature. A factorial sensitivity analysis explored the respective effects of the less documented model parameters as (i) agent migration speed, (ii) LDL oxidation rate and (iii) concentration of autoantibody agents. Finally, the response of the model to known perturbations was assessed by introducing statins agents, able to reduce the oxidation rate of LDL agents and the LDL boundary concentrations. Altered nutrition in the intervertebral disc affects cell viability and can generate catabolic cascades contributing to extracellular matrix (ECM) degradation. Such degradation is expected to affect couplings between disc mechanics and nutrition, contributing to accelerate degenerative processes. However, the relation of ECM changes to major biophysical events within the loaded disc remains unclear. A L4-L5 disc finite element model including the nucleus (NP), annulus (AF) and endplates was used and coupled to a transport-cell viability model. Solute concentrations and cell viability were evaluated along the mid-sagittal plane path. A design of experiment (DOE) was performed. DOE parameters corresponded to AF and NP biochemical tissue measurements in discs with different degeneration grades. Cell viability was not affected by any parameter combinations defined. Nonetheless, the initial water content was the parameter that affected the most the solute contents, especially glucose. Calculations showed that altered NP composition could negatively affect AF cell nutrition. Results suggested that AF and NP tissue degeneration are not critical to nutrition-related cell viability at early-stage of disc degeneration. However, small ECM degenerative changes may alter significantly disc nutrition under mechanical loads. Coupling disc mechano-transport simulations and enzyme expression studies could allow identifying spatiotemporal sequences related to tissue catabolism. Purpose: To assess, with finite element (FE) calculations, whether immediate weight bearing would be possible after surgical stabilization either with cannulated screws or with a locking plate in a split fracture of the lateral tibial plateau (LTP). Methods: A split fracture of the LTP was recreated in a FE model of a human tibia. A three-dimensional FE model geometry of a human femur-tibia system was obtained from the VAKHUM project database, and was built from CT images from a subject with normal bone morphologies and normal alignment. The mesh of the tibia was reconverted into a geometry of NURBS surfaces. A split fracture of the lateral tibial plateau was reproduced by using geometrical data from patient radiographs. A locking screw plate (LP) and a cannulated screw (CS) systems were modelled to virtually reduce the fracture and 80 kg static body-weight was simulated. Results: While the simulated body-weight led to clinically acceptable interfragmentary motion, possible traumatic bone shear stresses were predicted nearby the cannulated screws. With a maximum estimation of about 1.7 MPa maximum bone shear stresses, the Polyax system might ensure more reasonable safety margins. Conclusions: Split fractures of the LTP fixed either with locking screw plate or cannulated screws showed no clinically relevant IFM in a FE model. The locking screw plate showed higher mechanical stability than cannulated screw fixation. The locking screw plate might also allow full or at least partial weight bearing under static posture at time zero. During daily activities, complex biomechanical interactions influence the biophysical regulation of intervertebral disks (IVDs), and transfers of mechanical loads are largely controlled by the stabilizing action of spine muscles. Muscle and other internal forces cannot be easily measured directly in the lumbar spine. Hence, biomechanical models are important tools for the evaluation of the loads in those tissues involved in low-back disorders. Muscle force estimations in most musculoskeletal models mainly rely, however, on inverse calculations and static optimizations that limit the predictive power of the numerical calculations. In order to contribute to the development of predictive systems, we coupled a predictive muscle model with the passive resistance of the spine tissues, in a L3â€“S1 musculoskeletal finite element model with osmo-poromechanical IVD descriptions. The model included 46 fascicles of the major back muscles that act on the lower spine. The muscle model interacted with activity-related loads imposed to the osteoligamentous structure, as standing position and night rest were simulated through distributed upper body mass and free IVD swelling, respectively. Calculations led to intradiscal pressure values within ranges of values measured in vivo. Disk swelling led to muscle activation and muscle force distributions that seemed particularly appropriate to counterbalance the anterior body mass effect in standing. Our simulations pointed out a likely existence of a functional balance between stretch-induced muscle activation and IVD multiphysics toward improved mechanical stability of the lumbar spine understanding. This balance suggests that proper night rest contributes to mechanically strengthen the spine during day activity. Capturing patient- or condition-specific intervertebral disk (IVD) properties in finite element models is outmost important in order to explore how biomechanical and biophysical processes may interact in spine diseases. However, disk degenerative changes are often modeled through equations similar to those employed for healthy organs, which might not be valid. As for the simulated effects of degenerative changes, they likely depend on specific disk geometries. Accordingly, we explored the ability of continuum tissue models to simulate disk degenerative changes. We further used the results in order to assess the interplay between these simulated changes and particular IVD morphologies, in relation to disk cell nutrition, a potentially important factor in disk tissue regulation. A protocol to derive patient-specific computational models from clinical images was applied to different spine specimens. In vitro, IVD creep tests were used to optimize poro-hyperelastic input material parameters in these models, in function of the IVD degeneration grade. The use of condition-specific tissue model parameters in the specimen-specific geometrical models was validated against independent kinematic measurements in vitro. Then, models were coupled to a transport-cell viability model in order to assess the respective effects of tissue degeneration and disk geometry on cell viability. While classic disk poro-mechanical models failed in representing known degenerative changes, additional simulation of tissue damage allowed model validation and gave degeneration-dependent material properties related to osmotic pressure and water loss, and to increased fibrosis. Surprisingly, nutrition-induced cell death was independent of the grade-dependent material properties, but was favored by increased diffusion distances in large IVDs. Our results suggest that in situ geometrical screening of IVD morphology might help to anticipate particular mechanisms of disk degeneration. Objective To investigate the relevance of the human vertebral endplate poromechanics on the fluid and metabolic transport from and to the intervertebral disc (IVD) based on educated estimations of the poromechanical parameter values of the bony endplate (BEP). Methods 50 micro-models of different BEP samples were generated from μCTs of lumbar vertebrae and allowed direct determination of porosity values. Permeability values were calculated by using the micro-models, through the simulation of permeation via computational fluid dynamics. These educated ranges of porosity and permeability values were used as inputs for mechano-transport simulations to assess their effect on both the distributions of metabolites within an IVD model and the poromechanical calculations within the cartilaginous part of the endplate i.e., the cartilage endplate (CEP). Results BEP effective permeability was highly correlated to local variations of porosity (R2 ≈ 0.88). Universal patterns between bone volume fraction and permeability arose from these results and from other experimental data in the literature. These variations in BEP permeability and porosity had negligible effects on the distributions of metabolites within the disc. In the CEP, the variability of the poromechanical properties of the BEP did not affect the predicted consolidation but induced higher fluid velocities. Conclusions The present paper provides the first sets of thoroughly identified BEP parameter values that can be further used in patient-specific poromechanical studies. Representing BEP structural changes through variations in poromechanical properties did not affect the diffusion of metabolites. However, attention might be paid to alterations in fluid velocities and cell mechano-sensing within the CEP. Novel strategies to heal discogenic low back pain could highly benefit from comprehensive biophysical studies that consider both mechanical and biological factors involved in intervertebral disc degeneration. A decrease in nutrient availability at the bone-disc interface has been indicated as a relevant risk factor and as a possible initiator of cell death processes. Mechanical behaviour of both healthy and degenerated discs could highly interact with cell death in these compromised situations. In the present study, a mechano-transport finite element model was used to investigate the nature of mechanical effects on cell death processes via load-induced metabolic transport variations. Cycles of static sustained compression were chosen to simulate daily human activity. Healthy and degenerated cases were simulated as well as a reduced supply of solutes and an increase in solute exchange area at the bone-disc interface. Results showed that a reduction in metabolite concentrations at the bone-disc boundaries induced cell death, even when the increased exchange area was simulated. Slight local mechanical enhancements of glucose in the disc centre were capable of decelerating cell death but occurred only with healthy mechanical properties. However, mechanical deformations were responsible for a worsening in terms of cell death in the inner annulus, a disadvantaged zone far from the boundary supply with both an increased cell demand and a strain-dependent decrease of diffusivity. Such adverse mechanical effects were more accentuated when degenerative properties were simulated. Overall, this study paves the way for the use of biophysical models for a more integrated understanding of intervertebral disc pathophysiology. AbstractBackground Hip arthritis is a pathology linked to hip-cartilage degeneration. Although the aetiology of this disease is not well defined, it is known that age is a determinant risk factor. However, hip arthritis in young patients could be largely promoted by biomechanical factors. The objective of this paper is to analyze the impact of some normal anatomical variations on the cartilage stress distributions numerically predicted at the hip joint during walking. 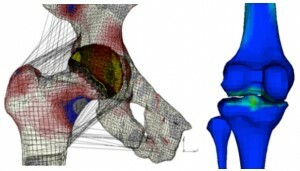 Methods A three-dimensional finite element model of the femur and the pelvis with the most relevant axial components of muscle forces was used to simulate normal walking activity. The hip anatomical condition was defined by: neck shaft angle, femoral anteversion angle, and acetabular anteversion angle with a range of 110-130Âº, 0-20Âº, and 0-20Âº, respectively. The direct boundary method was used to simulate the hip contact. Findings The hydrostatic stress found at the cartilage and labrum showed that a Â± 10Âº variation with respect to the reference brings significant differences between the anatomic models. Acetabular anteversion angle of 0Âº and femoral anteversion angle of 0Âº were the most affected anatomical conditions with values of hydrostatic stress in the cartilage near 5 MPa under compression. Interpretation Cartilage stresses and contact areas were equivalent to the results found in literature and the most critical anatomical regions in terms of tissue loads were in a good accordance with clinical evidence. Altogether, results showed that decreasing femoral or acetabular anteversion angles isolately causes a dramatic increase in cartilage loads. Summary Statement An organ culture experiment was simulated to explore the mechanisms that can link cell death to mechanical overload in the intervertebral disc. Coupling cell nutrition and tissue deformations led to altered metabolic transport that largely explained cell viability measurements.Introduction Part of intervertebral disc (IVD) maintenance relies on limited nutrient availability to the cells and on mechanical loads, but effective implication of these two factors is difficult to quantify. Theoretical models have helped to understand the link between solute transport and cell nutrition in deforming IVD, but omitted the direct link between tissue mechanics and cell metabolism. Hence, we explored numerically the relation between disc mechanics and cell death in relation to an organ culture experiment.Methods A finite element model of a caudal bovine IVD was created to reproduce an organ culture experiment. All subtissues were modelled, and coupled to cell metabolism in two ways: (i) mechanical strains and metabolic reactions were simply coupled to the diffusions of oxygen, lactate and glucose through a mechano-transport algorithm (IND model). (ii), a hypermetabolism model based on in vitro data involved a 30% increase in glucose consumption by the cells, activated either as a Step or as a Gaussian function over 15% strain (DIR model). Exponential decays of cell density occurred below 0.5 mM of glucose and/or below pH 6.78. Concentrations of 21 kPa oxygen and 4.5 mM glucose were imposed at the boundary, and a combination of 0.2 MPa compression and 10Â° bending was applied over 7 days.Results The highest hypermetabolic response was given by the Step activation. For all models, cell death mostly occurred in the compressed area of the flexed IVD, and steady-state cell viability was reached in about two days of load. In the outer annulus fibrosus (AF), the DIR model with Step activation led to increased cell death, in line with the cell viability measured in vitro. In the inner AF, all cell viability results matched the reported measurements.Discussion/Conclusion This study focused on elucidating the links between mechanical stimulation and cell survival in the IVD, and simulation of nutrition issues allowed reproducing the results of an organ culture experiment. Results suggest that mechano-regulated metabolism can play a significant role in the nutrition-related cell death. Truly, the IND model gave both low glucose and low pH, and altered metabolic transport represented the main cell death mechanism. Yet, the role of hypermetabolism was increased nearby the nutrient supply at the outer AF, meaning that cell death could occur, even in regions where nutrient supply seems ensured by short diffusion distances. Though further mechanistic developments must be considered, this novel mechano-regulated metabolism model permits mechano-transport models to be used to explore important interactions between tissue biophysics and multiphysics. In particular, the extracellular matrix degradation along degeneration and cell death can be coupled to the poromechanical parameters introduced, e.g. initial porosity and osmotic pressure values that largely depend on the proteoglycan concentration. This chapter focuses on the use of the finite element method in the design and exploration of spinal implants. Following an introduction to biomechanical alterations of the spine in disease and to spine finite element modelling, focus is placed on different models developed for spine treatment simulations. Despite the hindrance of working thorough representations of in vivo situations, predictions of load transfer within both the implants and the tissues simulated allow improved interpretations of known clinical outcomes, and permit the educated design of new implants. The potential of probabilistic modelling is also discussed in relation to model validation and patient-specific analyses. Finally, the latest developments in the multiphysical modelling of intervertebral discs are presented, revealing a strong potential for the study of implant-based strategies that aim to restore the functional biophysics of the spine. Several computational models based on experimental techniques and theories have been proposed to describe cytoskeleton (CSK) mechanics. Tensegrity is a prominent model for force generation, but it cannot predict mechanics of individual CSK components, nor explain the discrepancies from the different single cell stimulating techniques studies combined with cytoskeleton-disruptors. A new numerical concept that defines a multi-structural 3D finite element (FE) model of a single-adherent cell is proposed to investigate the biophysical and biochemical differences of the mechanical role of each cytoskeleton component under loading. The model includes prestressed actin bundles and microtubule within cytoplasm and nucleus surrounded by the actin cortex. We performed numerical simulations of atomic force microscopy (AFM) experiments by subjecting the cell model to compressive loads. The numerical role of the CSK components was corroborated with AFM force measurements on U2OS-osteosarcoma cells and NIH-3T3 fibroblasts exposed to different cytoskeleton-disrupting drugs. Computational simulation showed that actin cortex and microtubules are the major components targeted in resisting compression. This is a new numerical tool that explains the specific role of the cortex and overcomes the difficulty of isolating this component from other networks invitro. This illustrates that a combination ofcytoskeletal structures with their own properties is necessary for a complete description of cellular mechanics. Numerical studies of the intervertebral disc (IVD) are important to better understand the load transfer and the mechanobiological processes within the disc. Among the relevant calculations, fluid-related outputs are critical to describe and explore accurately the tissue properties. Porohyperelastic finite element models of IVD can describe accurately the disc behaviour at the organ level and allow the inclusion of fluid effects. However, results may be affected by numerical instabilities when fast load rates are applied. We hypothesized that such instabilities would appear preferentially at material discontinuities such as the annulus-nucleus boundary and should be considered when testing mesh convergence. A L4-L5 IVD model including the nucleus, annulus and cartilage endplates were tested under pure rotational loads, with different levels of mesh refinement. The effect of load relaxation and swelling were also studied. Simulations indicated that fluid velocity oscillations appeared due to numerical instability of the pore pressure spatial derivative at material discontinuities. Applying local refinement only was not enough to eliminate these oscillations. In fact, mesh refinements had to be local, material-dependent, and supplemented by the creation of a material transition zone, including interpolated material properties. Results also indicated that oscillations vanished along load relaxation, and faster attenuation occurred with the incorporation of the osmotic pressure. We concluded that material discontinuities are a major cause of instability for poromechanical calculations in multi-tissue models when load velocities are simulated. A strategy was presented to address these instabilities and recommendations on the use of IVD porohyperelastic models were given. The collagen network of the annulus fibrosus largely controls the functional biomechanics of the lumbar intervertebral discs (IVDs). Quantitative anatomical examinations have shown bundle orientation patterns, possibly coming from regional adaptations of the annulus mechanics. This study aimed to show that the regional differences in annulus mechanical behaviour could be reproduced by considering only fibre orientation changes. Using the finite element method, a lumbar annulus was modelled as a poro-hyperelastic material in which fibres were represented by a direction-dependent strain energy density term. Fibre orientations were calibrated to reproduce the annulus tensile behaviours measured for four different regions: posterior outer, anterior outer, posterior inner and anterior inner. The back-calculated fibre angles and regional patterns as well as the global disc behaviour were comparable with anatomical descriptions reported in the literature. It was concluded that annulus fibre variations might be an effective tool to calibrate lumbar spine IVD and segment models. Comprehensive understanding of disc degeneration and low back pain requires knowledge about both the mechanical and the biological factors that may affect tissue maintenance. In the present study, a coupled intervertebral disc model with a porohyperelastic formulation (mechanics) and a glycolitic metabolic transport and cell viability (biology) were used. Mechanotransduction phenomena were investigated. Boundary conditions and disc model characteristics, both inspired from an organ culture experiment, were introduced. The model predicted cell death in the most compressed region of the intervertebral disc, in agreement with the simulated experiment. Such result was attributed to a local effect of reduced metabolites diffusion when coupled to local mechanics in the porohyperelastic disc. Direct force sensing by the cells was explored and was shown to potentially extend the risk area in terms of cell death. The study contributes to the elucidation of mechanotransduction phenomena in the spine, and paves the way to biophysical developments, highly relevant to mechanobiology-inspired treatments of low-back pain. Tissue engineering uses porous biomaterial scaffolds to support the complex tissue healing process to fulfill two main functions: (1) to support mechanical loading and (2) to allow mass transport. Computational methods have been extensively applied to characterize scaffold morphology and to simulate different biological processes of tissue engineering. In addition, phenomena such a cell seeding, cell migration, cell proliferation, cell differentiation, vascularisation, oxygen consumption, mass transport or scaffold degradation can be simulated using computational methods. A review of the different methods used to model scaffolds in tissue engineering is described in this chapter. Cell seeding is a critical step in tissue engineering. A high number of cells evenly distributed in scaffolds after seeding are associated with a more functional tissue culture. Furthermore, high cell densities have shown the possibility to reduce culture time or increase the formation of tissue. Experimentally, it is difficult to predict the cell-seeding process. In this study, a new methodology to simulate the cell-seeding process under perfusion conditions is proposed. The cells are treated as spherical particles dragged by the fluid media, where the physical parameters are computed through a Lagrangian formulation. The methodology proposed enables to define the kinetics of cell seeding continuously over time. An exponential relationship was found to optimize the seeding time and the number of cells seeded in the scaffold. The cell distribution and cell efficiency predicted using this methodology were similar to the experimental results of Melchels et al. One of the main advantages of this method is to be able to determine the three-dimensional position of all the seeded cells and to, therefore, better know the initial conditions for further cell proliferation and differentiation studies. This study opens up the field of numerical predictions related to the interactions between biomaterials, cells, and dynamics media. The extremely fine structure of vertebral cortex challenges reliable determination of the tissue's anisotropic elasticity, which is important for the spine's load carrying patterns often causing pain in patients. As a potential remedy, we here propose a combined experimental (ultrasonic) and modeling (micromechanics) approach. Longitudinal acoustic waves are sent in longitudinal (superior-inferior, axial) as well as transverse (circumferential) direction through millimeter-sized samples containing this vertebral cortex, and corresponding wave velocities agree very well with recently identified 'universal' compositional and acoustic characteristics (J Theor Biol 287:115, 2011), which are valid for a large data base comprising different bones from different species and different organs. This provides evidence that the 'universal' organization patterns inherent to all the bone tissues of the aforementioned data base also hold for vertebral bone. Consequently, an experimentally validated model covering the mechanical effects of this organization patterns (J Theor Biol 244:597, 2007, J Theor Biol 260:230, 2009) gives access to the complete elasticity tensor of human lumbar vertebral bone tissue, as a valuable input for structural analyses aiming at patient-specific fracture risk assessment, e.g. based on the Finite Element Method. When the intervertebral disc is removed to relieve chronic pain, subsequent segment stabilization should restore the functional mechanics of the native disc. Because of partially constrained motions and the lack of intrinsic rotational stiffness ball-on-socket implants present many disadvantages. Composite disc substitutes mimicking healthy disc structures should be able to assume the role expected for a disc substitute with fewer restrictions than ball-on-socket implants. A biomimetic composite disc prototype including artificial nucleus fibre-reinforced annulus and endplates was modelled as an L4–L5 disc substitute within a L3–L5 lumbar spine finite element model. Different device updates, i.e. changes of material properties fibre distributions and volume fractions and nucleus placements were proposed. Load- and displacement-controlled rotations were simulated with and without body weight applied. The original prototype reduced greatly the flexibility of the treated segment with significant adjacent level effects under displacement-controlled or hybrid rotations. Device updates allowed restoring large part of the global axial and sagittal rotational flexibility predicted with the intact model. Material properties played a major role, but some other updates were identified to potentially tune the device behaviour against specific motions. All device versions altered the coupled intersegmental shear deformations affecting facet joint contact through contact area displacements. Loads in the bony endplates adjacent to the implants increased as the implant stiffness decreased but did not appear to be a strong limitation for the implant biomechanical and mechanobiological functionality. In conclusion, numerical results given by biomimetic composite disc substitutes were encouraging with greater potential than that offered by ball-on-socket implants. Proper cell density and spatial distribution in a 3D scaffold are essential to morphogenetic development of an engineered tissue. The aim of this study was to combine computational and experimental techniques to study cell seeding under dynamic conditions. Rapid prototyped poly-caprolactone scaffolds, 5 mm in diameter and 1.5 mm in height, were used in a custom-made microfluidic chamber, thus enabling live visualization of the seeding process. The scaffold morphologies were reconstructed from micro CT images and the fluid volume was created similar to the microfluidic chamber. Computationally cell motion was represented as spherical particles in a fluid medium using a multiphase Lagrangian formulation implemented in Ansys Fluent. Cells were dragged by the fluid flow and adhesion was quantified using wall film theory. Experimentally, fluorescent microspheres, 10 um in diameter, were used, and fluid flow was controlled with a syringe pump. Inlet fluid flow was applied at 0.15 mm/s, identical to the model condition. Live imaging of the seeding process in the microfluidic chamber enables to record particle trajectory and velocity and possible zone of cell adhesion. The computational simulation shows velocities (≈0.6mm/s) in agreement with the particles experiment. 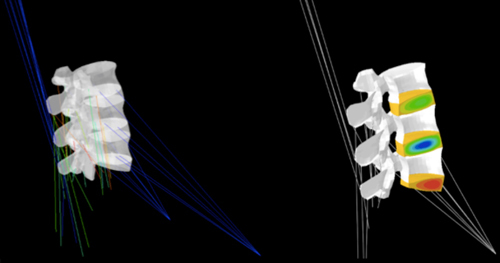 Particles distributions was similar and can be highlighted the scaffold design in fluid accessibility.model proposed in a lumbar spine model, given the limited number of parameters involved. Spinal muscles provide stability of the trunk and transmit loading onto the vertebra and intervertebral discs. Current lumbar spine finite element models overlook such muscle contribution or suggest simplifications far from the reality. This study proposes to address this limitation by developing a novel active lumbar spine muscle model. A modified quasi-incompressible fibre-reinforced hyperelastic constitutive model was adopted for the passive and active behavior of the lumbar musculature. The constitutive relation was expressed in terms of muscle fibre, matrix deviatoric and volumetric stresses. A single unidirectional element was used to assess the model under 30% traction and 20% compression strains. For the active fibre stress, a parametric study defined suitable values for a strain-like parameter ζCE that controls muscle activation through deformation thresholds. Stress analysis revealed that ζCE values derived for the different lumbar muscles from literature-based morphometric criteria were unable to induce any active response. Thus, alternative values were proposed keeping the relative activations of the muscles modelled as suggested by the relation of ζCE to the functional geometrical characteristics of these muscles. Stress results for all models were in the plausible range of values reported in literature for the erect posture. The Psoas Major, though, showed an unrealistic high activation for compression strains over 15%. Therefore, a phenomenological calibration of the parameter ζCE would allow further implementation of the constitutive model proposed in a lumbar spine model, given the limited number of parameters involved. Fluid flow predictions are important in intervertebral disc models to explore the mechanobiology and biomechanics of the tissue. Poroelastic models are used in this sense, but the results from applying physiological load rates may present instabilities. Four IVD models including the annulus fibrosus, the nucleus pulposus, and the endplates were used with different mesh sizes under physiological extension and axial rotational loads. Simulations indicated that oscillations were caused by numerical instability of the pore pressure derivation at material discontinuities. Applying local refinement only was not enough to eliminate the instabilities. Indeed, mesh refinements had to be local and material-dependent, and had to be supplemented by the creation of a material transition zone, including exponentially interpolated material properties between the nucleus and the annulus. The degeneration process in the intervertebral disc (IVD) is linked to progressive cell death and to mechanical factors. Therefore, the inclusion of cell viability criteria coupled with disc mechanics in a computational model would enable to get a better understanding of the degeneration process in IVD. A recently developed finite element (FE) model of the L4-L5 IVD based on poromechanics and IVD metabolism (Malandrino et al., 2011) was modified to include an exponential decay of cells over time below critical glucose and pH levels. The implementation was verified against in vitro literature data on cell viability. Viability criteria were used in the IVD model where diffusions of glucose, oxygen and lactate accounted for predicted porosity and volume changes. Subtissue-specific mechanical properties and cell concentrations were modelled. Daily compressive phases (standing and resting) were applied. Metabolite boundary concentrations were reduced at the endplates to induce critical conditions within the IVD. Solutions with and without mechanical coupling were compared. Critical glucose rather than pH levels were relevant to cell viability far away from the solute supply. Deformation couplings increased glucose in the disc centre so that cells stopped dying up to 10 hours earlier over two days simulated when mechanical deformations were considered. These results can help in the understanding of coupled mechanical and biological factors. If metabolite supply is disturbed, as it could happen during endplate calcification or circulatory diseases, a local accelerated cell death in the disc centre may occur in absence of tissue compliance. This study highlights the need to restore both nutritional and mechanical factors in order to favour cell viability along regenerative treatments. Apart from partial or total joint replacement, no surgical procedure is currently available to treat large and deep cartilage defects associated with advanced diseases such as osteoarthritis. In this work, we developed a perfusion bioreactor system to engineer human cartilage grafts in a size with clinical relevance for unicompartmental resurfacing of human knee joints (50 mm diameter x 3 mm thick). Computational fluid dynamics models were developed to optimize the flow profile when designing the perfusion chamber. Using the developed system, human chondrocytes could be seeded throughout large 50 mm diameter scaffolds with a uniform distribution. Following two weeks culture, tissues grown in the bioreactor were viable and homogeneously cartilaginous, with biomechanical properties approaching those of native cartilage. In contrast, tissues generated by conventional manual production procedures were highly inhomogeneous and contained large necrotic regions. The unprecedented engineering of human cartilage tissues in this large-scale opens the practical perspective of grafting functional biological substitutes for the clinical treatment for extensive cartilage defects, possibly in combination with surgical or pharmacological therapies to support durability of the implant. Ongoing efforts are aimed at integrating the up-scaled bioreactor based processes within a fully automated and closed manufacturing system for safe, standardized, and GMP compliant production of large-scale cartilage grafts. Mechanical stimuli are one of the factors that influence tissue differentiation. In the development of biomaterials for bone tissue engineering, mechanical stimuli and formation of a vascular network that transport oxygen to cells within the pores of the scaffolds are essential. Angiogenesis and cell differentiation have been simulated in scaffolds of regular porosity; however, the dynamics of differentiation can be different when the porosity is not uniform. The objective of this study was to investigate the effect of the mechanical stimuli and the capillary network formation on cell differentiation within a scaffold of irregular morphology. A porous scaffold of calcium phosphate based glass was used. The pores and the solid phase were discretized using micro computed tomography images. Cell activity was simulated within the interconnected pore domain of the scaffold using a lattice modeling approach. Compressive strains of 0.5 and 1% of total deformation were applied and two cases of mesenchymal stem cells initialization (in vitro seeding and in vivo) were simulated. Similar capillary networks were formed independently of the cell initialization mode and the magnitude of the mechanical strain applied. Most of vessels grew in the pores at the periphery of the scaffolds and were blocked by the walls of the scaffold. When 0.5% of strain was applied, 70% of the pore volume was affected by mechano-regulatory stimuli corresponding to bone formation; however, because of the lack of oxygen, only 40% of the volume was filled with osteoblasts. 40% of volume was filled with chondrocytes and 3% with fibroblasts. When the mechanical strain was increased to 1%, 11% of the pore volume was filled with osteoblasts, 59% with chondrocytes, and 8% with fibroblasts. This study has shown the dynamics of the correlation between mechanical load, angiogenesis and tissue differentiation within a scaffold with irregular morphology. A computational model of mechanoregulation is proposed to predict bone tissue formation stimulated mechanically by overall dynamical compression within a porous polymeric scaffold rendered by micro-CT. Dynamic compressions of 0.5-5% at 0.0025-0.025 s(-1) were simulated. A force-controlled dynamic compression was also performed by imposing a ramp of force from 1 to 70 N. The model predicts homogeneous mature bone tissue formation under strain levels of 0.5-1% at strain rates of 0.0025-0.005 s(-1). Under higher levels of strain and strain rates, the scaffold shows heterogeneous mechanical behaviour which leads to the formation of a heterogeneous tissue with a mixture of mature bone and fibrous tissue. A fibrous tissue layer was also predicted under the force-controlled dynamic compression, although the same force magnitude was found promoting only mature bone during a strain-controlled compression. The model shows that the mechanical stimulation of bone tissue formation within a porous scaffold closely depends on the loading history and on the mechanical behaviour of the scaffold at local and global scales. Readers of this chapter will learn about our approach to computer simulation of tissue differentiation in response to mechanical forces. It involves defining algorithms for mechanoregulation of each of following cell activities: proliferation, apoptosis, migration, and differentiation using a stimulus based on a combination of strain and fluid flow (Prendergast et al., J. Biomech., 1997) - algorithms are based on a lattice-modelling which also facilitates building algorithms for complex processes such as angiogenesis. The algorithms are designed to be collaboratable individually. They can be combined to create a computational simulation method for tissue differentiation, using finite element analysis to compute the mechanical stimuli in even quite complex biomechanical environments. Examples are presented of the simulation method in use. A computational model based on finite element method (FEM) and computational fluid dynamics (CFD) is developed to analyse the mechanical stimuli in a composite scaffold made of polylactic acid (PLA) matrix with calcium phosphate glass (Glass) particles. Different bioreactor loading conditions were simulated within the scaffold. In vitro perfusion conditions were reproduced in the model. Dynamic compression was also reproduced in an uncoupled fluid-structure scheme: deformation level was studied analyzing the mechanical response of scaffold alone under static compression while strain rate was studied considering the fluid flow induced by compression through fixed scaffold. Results of the model show that during perfusion test an inlet velocity of 25mum/s generates on scaffold surface a fluid flow shear stress which may stimulate osteogenesis. Dynamic compression of 5% applied on the PLA-Glass scaffold with a strain rate of 0.005s(-1) has the benefit to generate mechanical stimuli based on both solid shear strain and fluid flow shear stress on large scaffold surface area. Values of perfusion inlet velocity or compression strain rate one order of magnitude lower may promote cell proliferation while values one order of magnitude higher may be detrimental for cells. FEM-CFD scaffold models may help to determine loading conditions promoting bone formation and to interpret experimental results from a mechanical point of view. Tissue engineering scaffolds provide temporary mechanical support for tissue regeneration and transfer global mechanical load to mechanical stimuli to cells through its architecture. In this study the interactions between scaffold pore morphology, mechanical stimuli developed at the cell microscopic level, and culture conditions applied at the macroscopic scale are studied on two regular scaffold structures. Gyroid and hexagonal scaffolds of 55% and 70% porosity were modeled in a finite element analysis and were submitted to an inlet fluid flow or compressive strain. A mechanoregulation theory based on scaffold shear strain and fluid shear stress was applied for determining the influence of each structures on the mechanical stimuli on initial conditions. Results indicate that the distribution of shear stress induced by fluid perfusion is very dependent on pore distribution within the scaffold. Gyroid architectures provide a better accessibility of the fluid than hexagonal structures. Based on the mechanoregulation theory, the differentiation process in these structures was more sensitive to inlet fluid flow than axial strain of the scaffold. This study provides a computational approach to determine the mechanical stimuli at the cellular level when cells are cultured in a bioreactor and to relate mechanical stimuli with cell differentiation. A statistical factorial analysis approach was conducted on a poroelastic finite element model of a lumbar intervertebral disc to analyse the influence of six material parameters (permeabilities of annulus, nucleus, trabecular vertebral bone, cartilage endplate and Young's moduli of annulus and nucleus) on the displacement, fluid pore pressure and velocity fields. Three different loading modes were investigated: compression, flexion and axial rotation. Parameters were varied considering low and high levels in agreement with values found in the literature for both healthy and degenerated lumbar discs. Results indicated that annulus stiffness and cartilage endplate permeability have a strong effect on the overall fluid- and solid-phase responses in all loading conditions studied. Nucleus stiffness showed its main relevance in compression while annulus permeability influenced mainly the annular pressure field. This study confirms the permeability's central role in biphasic modelling and highlights for the lumbar disc which experiments of material property characterization should be performed. Moreover, such sensitivity study gives important guidelines in poroelastic material modelling and finite element disc validation. Scaffold biomaterials for tissue engineering can be produced in many different ways depending on the applications and the materials used. Most research into new biomaterials is based on an experimental trial-and-error approach that limits the possibility of making many variations to a single material and studying its interaction with its surroundings. Instead, computer simulation applied to tissue engineering can offer a more exhaustive approach to test and screen out biomaterials. In this paper, a review of the current approach in biomaterials designed through computer-aided design (CAD) and through finite-element modelling is given. First we review the approach used in tissue engineering in the development of scaffolds and the interactions existing between biomaterials, cells and mechanical stimuli. Then, scaffold fabrication through CAD is presented and characterization of existing scaffolds through computed images is reviewed. Several case studies of finite-element studies in tissue engineering show the usefulness of computer simulations in determining the mechanical environment of cells when seeded into a scaffold and the proper design of the geometry and stiffness of the scaffold. This creates a need for more advanced studies that include aspects of mechanobiology in tissue engineering in order to be able to predict over time the growth and differentiation of tissues within scaffolds. Finally, current perspectives indicate that more efforts need to be put into the development of such advanced studies, with the removal of technical limitations such as computer power and the inclusion of more accurate biological and genetic processes into the developed algorithms. Biomechanics is the study of the mechanics of a part or function of a living body and of the forces exerted by muscles and external loading on the skeletal structure. Biomechanics dates back to ancient times where the study of arthritis was known to be induced by joint disease. But it is only at the beginning of the twentieth century that biomechanical studies of joint materials such as articular cartilage, ligament, and bone began. Living tissues have some similarities with conventional engineering materials although they usually have complex structures that make them more difficult to study. In this chapter, a description of the composition and structure of the main tissues found in mammals is given. The relations between composition, structure and biomechanical properties are presented for bone, cartilage, skin, tendons and ligaments, muscles, and blood vessels and arteries. Finally, some aspects of joint biomechanics are described. A fundamental aspect of the rapidly expanding medical care sector, bone repair continues to benefit from emerging technological developments. This text provides researchers and students with a comprehensive review of the materials science and engineering principles behind these developments. The first part reviews the fundamentals of bone repair and regeneration. Further chapters discuss the science and properties of biomaterials used in bone repair, including both metals and biocomposites. Final chapters analyze device considerations such as implant lifetime and failure, and discuss potential applications, as well as the ethical issues that continually confront researchers and clinicians. - provides a comprehensive review of the materials science, engineering principles and recent advances in this important area - reviews the fundamentals of bone repair and regeneration addressing social, economic and clinical challenges - examines the properties of biomaterials used for bone repair with specific chapters assessing metals, ceramics, polymers and composites - discusses clinical applications and considerations including orthopaedic surgery and bone tissue engineering Bone repair is a fundamental part of the rapidly expanding medical care sector and has benefited from many recent technological developments. With an increasing number of technologies available, it is vital that the correct technique is selected for specific clinical procedures. This unique book will provide a comprehensive review of the materials science, engineering principles and recent advances in this important area. The first part of the book reviews the fundamentals of bone repair and regeneration. Chapters in the second part discuss the science and properties of biomaterials used for bone repair such as metals, ceramics, polymers and composites. The final section of the book discusses clinical applications and considerations with chapters on such topics as orthopaedic surgery, tissue engineering, implant retrieval and ethics of bone repair biomaterials. With its distinguished editors and team of international contributors, Bone repair biomaterials is an invaluable reference for researchers and clinicians within the biomedical industry and academia. Mechanical stimuli are one of the factors that affect cell proliferation and differentiation in the process of bone tissue regeneration. Knowledge on the specific deformation sensed by cells at a microscopic level when mechanical loads are applied is still missing in the development of biomaterials for bone tissue engineering. The objective of this study was to analyze the behavior of the mechanical stimuli within some calcium phosphate-based scaffolds in terms of stress and strain distributions in the solid material phase and fluid velocity, fluid pressure and fluid shear stress distributions in the pores filled of fluid, by means of micro computed tomographed (CT)-based finite element (FE) models. Two samples of porous materials, one of calcium phosphate-based cement and another of biodegradable glass, were used. Compressive loads equivalent to 0.5% of compression applied to the solid material phase and interstitial fluid flows with inlet velocities of 1, 10 and 100 mu m/s applied to the interconnected pores were simulated, changing also the inlet side and the viscosity of the medium. Similar strain distributions for both materials were found, with compressive and tensile strain maximal values of 1.6% and 0.6%, respectively. Mean values were consistent with the applied deformation. When 10 mu m/s of inlet fluid velocity and 1.45 Pa s viscosity, maximal values of fluid velocity were 12.76 mm/s for CaP cement and 14.87 mm/s for glass. Mean values were consistent with the inlet ones applied, and mean values of shear stress were around 5 x 10(-5) Pa. Variations on inlet fluid velocity and fluid viscosity produce proportional and independent changes in fluid velocity, fluid shear stress and fluid pressure. This study has shown how mechanical loads and fluid flow applied on the scaffolds cause different levels of mechanical stimuli within the samples according to the morphology of the materials.